Jump on board the #1 Rated mobile guide for Block Island. Let visitors know what is unique about your business with a 100-word description. Change your description at any time. A picture is worth a thousand words. Use a couple photos to motivate customers to come in and try your products and/or services. Clearly show where your business is located on our map of Block Island and give customers automated directions to your location. One touch Action Buttons that make it easy for people to call your business, email you, or visit your website right from their phone. Not only list your address but include a geo-tag on our digital map that allows customers to quickly find and navigate to your business. Display in real time the distance to your business from a visitor’s location so they know how far away they are and how to find you. Upgrade your listing to attract new customers and encourage repeat business. Attract more customers by adding additional photos and more information to your listing. Use additional images and an enhanced description of your products and services to pilot more customers into your place of business. Coupons options are only limited to your imagination. Coupons are redeemed right in front of you so there is no lost revenue. Best of all you can track usage analytics via the app. Get your key events included in the BI app calendar. Your announcement will appear on the app home screen on the day of the event as well as in the upcoming event listings. The net results will be more people coming to your special event! Include links to all your business PDFs. Make it easy for visitors to get more useful info right on their phone. Link to menus, schedules, brochures or any other printed materials you have. Add a discussion board to your listing to bring your content to life, fuel colorful discussions, efficiently moderate comments, and build engaged communities. Add multiple subcategories to your listing so visitors can find you easier. For example if you are a restaurant that serves American, Seafood and Italian cuisine you will appear in all related categories. In addition, it makes it easier for you to be found via the apps search functions. Select the listing option best suited to your business. About a sandwich & drink at the the BIG. About a round trip ferry ticket & a coffee. About a dinner & a drink out...probably less. Here are answers to some common questions we get about the Block Island App. How do I add my text and images? After you sign up, you will be linked to an electronic form where you can write your business description, add images, links and other information. You will get a chance to edit your review once it's live as well. What type of business can I list? Restaurants, shops, grocery stores, bars, real estate agencies or whatever service or product you sell. Our goal is to give the Block Island App users access to as many businesses as possible. We accept all major credit cards - Visa, MasterCard, Amex and Discover. If you would like to pay by check, just let us know and we will make it possible. I have an off island business can I list it? Do you have sample listings? Yes we do. Just download the app. Next select the menu on top left of screen. Scroll down to the bottom and select "List My Business". Here you will see example listings for Basic, Enhanced and Premium options. In addition, you can see all live listings. We only offer free basic listings for local government and non-profit organizations. We gave many Block Island businesses free listings for our first year but now have to charge to keep the app live and updated. Please contact us if you have more questions. What phones and devices does it work on? The app is optimized to work on all Apple and Android phones. In addition, it will work on any device via a browser, just go to m.theblockislandapp.com. 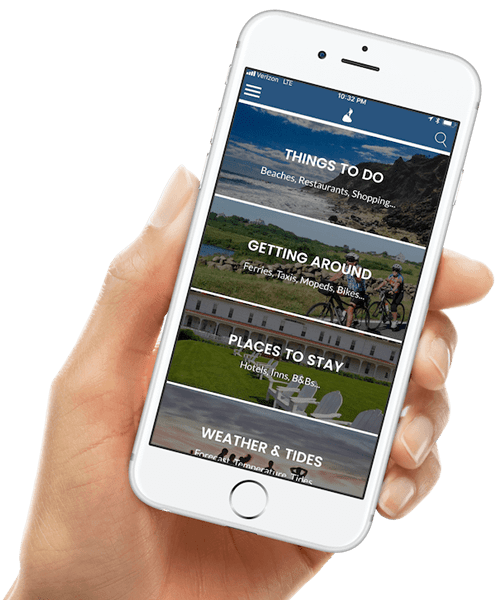 For use on Block Island we recommend using the mobile app for the best experience. How long is my listing in the app? All paid listings are for the calendar year. The app is live 24 X 7 and 365 days a year. So even during the winter your listing is still active. You can update your description if you are off island so people are aware but you stay present on peoples' phones year round.